Lectins are carbohydrate-binding proteins, macromolecules that are highly specific for sugar moieties. Long before a deeper understanding of their numerous biological functions, the plant lectins, also known as phytohemagglutinins, were noted for their particular high specificity for foreign glycoconjugates (e.g. those of fungi, invertebrates, and animals). and used in biomedicine for blood cell testing and in biochemistry for fractionation. Lectins perform recognition on the cellular and molecular level and play numerous roles in biological recognition phenomena involving cells, carbohydrates, and proteins. Lectins also mediate attachment and binding of bacteria and viruses to their intended targets. For example, it is hypothesized that some hepatitis C viral glycoproteins attach to C-type lectins on the host cell surface (liver cells) for infection. Lectins may be disabled by specific mono- and oligosaccharides, which bind to ingested lectins from grains, legume, nightshade plants and dairy; binding can prevent their attachment to the carbohydrates within the cell membrane. Some lectins may be powerful toxins as for instance ricin, and others have been incorporated into genetically engineered crops to transfer traits, such as resistance to pests and resistance to herbicides. The name "lectin" is derived from the Latin word legere, meaning, among other things, "to select". Although they were first discovered more than 100 years ago in plants, now lectins are known to be present throughout nature. It is generally believed that the earliest description of a lectin was given by Peter Hermann Stillmark in his doctoral thesis presented in 1888 to the University of Dorpat. Stillmark isolated ricin, an extremely toxic hemagglutinin, from seeds of the castor plant (Ricinus communis). The first lectin to be purified on a large scale and available on a commercial basis was concanavalin A, which is now the most-used lectin for characterization and purification of sugar-containing molecules and cellular structures. The legume lectins are probably the most well-studied lectins. Most lectins do not possess enzymatic activity. Lectins occur ubiquitously in nature. They may bind to a soluble carbohydrate or to a carbohydrate moiety that is a part of a glycoprotein or glycolipid. They typically agglutinate certain animal cells and/or precipitate glycoconjugates. Lectins serve many different biological functions in animals, from the regulation of cell adhesion to glycoprotein synthesis and the control of protein levels in the blood. They also may bind soluble extracellular and intercellular glycoproteins. Some lectins are found on the surface of mammalian liver cells that specifically recognize galactose residues. It is believed that these cell-surface receptors are responsible for the removal of certain glycoproteins from the circulatory system. Another lectin is a receptor that recognizes hydrolytic enzymes containing mannose-6-phosphate, and targets these proteins for delivery to the lysosomes. I-cell disease is one type of defect in this particular system. Lectins also are known to play important roles in the immune system. Within the innate immune system lectins such as the MBL, the mannose-binding lectin, help mediate the first-line defense against invading microorganisms. Other lectins within the immune system are thought to play a role in self-nonself discrimination and they likely modulate inflammatory and autoreactive processes. Intelectins (X-type lectins) were shown to bind microbial glycans and may function in the innate immune system as well. The function of lectins in plants (legume lectin) is still uncertain. Once thought to be necessary for rhizobia binding, this proposed function was ruled out through lectin-knockout transgene studies. The large concentration of lectins in plant seeds decreases with growth, and suggests a role in plant germination and perhaps in the seed's survival itself. The binding of glycoproteins on the surface of parasitic cells also is believed to be a function. Several plant lectins have been found to recognize non-carbohydrate ligands that are primarily hydrophobic in nature, including adenine, auxins, cytokinin, and indole acetic acid, as well as water-soluble porphyrins. It has been suggested that these interactions may be physiologically relevant, since some of these molecules function as phytohormones. Purified lectins are important in a clinical setting because they are used for blood typing. Some of the glycolipids and glycoproteins on an individual's red blood cells can be identified by lectins. A lectin from Dolichos biflorus is used to identify cells that belong to the A1 blood group. A lectin from Ulex europaeus is used to identify the H blood group antigen. A lectin from Vicia graminea is used to identify the N blood group antigen. A lectin from Iberis amara is used to identify the M blood group antigen. A lectin from coconut milk is used to identify Theros antigen. 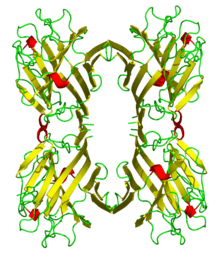 A lectin from Carex is used to identify R antigen. In neuroscience, the anterograde labeling method is used to trace the path of efferent axons with PHA-L, a lectin from the kidney bean. A lectin (BanLec) from bananas inhibits HIV-1 in vitro. Achylectins, isolated from Tachypleus tridentatus, show specific agglutinating activity against human A-type erythrocytes. Anti-B agglutinins such as anti-BCJ and anti-BLD separated from Charybdis japonica and Lymantria dispar, respectively, are of value both in routine blood grouping and research. Lectins from legume plants, such as PHA or concanavalin A, have been used widely as model systems to understand the molecular basis of how proteins recognize carbohydrates, because they are relatively easy to obtain and have a wide variety of sugar specificities. The many crystal structures of legume lectins have led to a detailed insight of the atomic interactions between carbohydrates and proteins. Concanavalin A and other commercially available lectins have been used widely in affinity chromatography for purifying glycoproteins. In general, proteins may be characterized with respect to glycoforms and carbohydrate structure by means of affinity chromatography, blotting, affinity electrophoresis, and affinity immunoelectrophoreis with lectins as well as in microarrays, as in evanescent-field fluorescence-assisted lectin microarray. The second domain is an N-glycosidase that cleaves nucleobases from ribosomal RNA, resulting in inhibition of protein synthesis and cell death. Foods with high concentrations of lectins, such as beans, cereal grains, seeds, nuts, and potatoes, may be harmful if consumed in excess in uncooked or improperly-cooked form. Adverse effects may include nutritional deficiencies, and immune (allergic) reactions. Possibly, most effects of lectins are due to gastrointestinal distress through interaction of the lectins with the epithelial cells of the gut. A recent in vitro study has suggested that the mechanism of lectin damage may occur by interfering with the repair of already-damaged epithelial cells. Lectins are considered another major family of protein antinutrients (ANCs), which are specific sugar-binding proteins exhibiting reversible carbohydrate-binding activities. Lectins are similar to antibodies in their ability to agglutinate red blood cells. The toxicity of lectins has been identified by consumption of food with high lectin content, which may lead to diarrhea, nausea, bloating, and vomiting. Many legume seeds have been proven to contain high lectin activity, termed hemagglutinating activity. Soybean is the most important grain legume crop in this category. Its seeds contain high activity of soybean lectins (soybean agglutinin or SBA). SBA is able to disrupt small intestinal metabolism and damage small intestinal villi via the ability of lectins to bind with brush border surfaces in the distal part of small intestine. Heat processing can reduce the toxicity of lectins, but low temperature or insufficient cooking may not completely eliminate their toxicity, as some plant lectins are resistant to heat. Lectin may cause leptin resistance, affecting its functions (signal have high levels of leptin and several effects gathering to protect from lipid overload), as indicated by studies on effects of single nucleotide polymorphisms on the function of leptin and the leptin receptor. Such leptin resistance may translate into diseases, notably it could be responsible for obesity in humans who have high levels of leptin. Lectin may involve in pattern recognition and pathogen elimination in the innate immunity of vertebrates including fishes. ↑ "Lectin list" (PDF). Interchim. 2010. Retrieved 2010-05-05. ↑ Oldroyd, Giles E.D. ; Downie, J. Allan (2008). 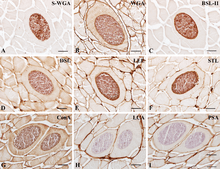 "Coordinating Nodule Morphogenesis with Rhizobial Infection in Legumes". Annual Review of Plant Biology. 59: 519–46. doi:10.1146/annurev.arplant.59.032607.092839. PMID 18444906. ↑ Komath SS, Kavitha M, Swamy MJ (March 2006). 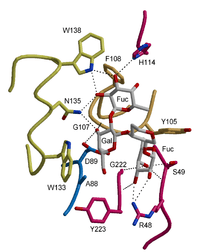 "Beyond carbohydrate binding: new directions in plant lectin research". Org. Biomol. Chem. 4 (6): 973–88. doi:10.1039/b515446d. PMID 16525538. ↑ Sharon, N.; Lis, H (2004). "History of lectins: From hemagglutinins to biological recognition molecules". Glycobiology. 14 (11): 53R–62R. doi:10.1093/glycob/cwh122. PMID 15229195. ↑ Carlson, Neil R. (2007). Physiology of behavior. Boston: Pearson Allyn & Bacon. ISBN 0-205-46724-5. ↑ Swanson, M. D.; Winter, H. C.; Goldstein, I. J.; Markovitz, D. M. (2010). "A Lectin Isolated from Bananas is a Potent Inhibitor of HIV Replication". Journal of Biological Chemistry. 285 (12): 8646–55. doi:10.1074/jbc.M109.034926. PMC 2838287 . PMID 20080975. ↑ Viswambari Devi, R.; Basilrose, M. R.; Mercy, P. D. (2010). "Prospect for lectins in arthropods". Italian Journal of Zoology. 77 (3): 254–260. doi:10.1080/11250003.2010.492794. ↑ Cordain, Loren; Toohey, L.; Smith, M. J.; Hickey, M. S. (2007). "Modulation of immune function by dietary lectins in rheumatoid arthritis". British Journal of Nutrition. 83 (3): 207–17. doi:10.1017/S0007114500000271. PMID 10884708. ↑ Jönsson, Tommy; Olsson, Stefan; Ahrén, Bo; Bøg-Hansen, Thorkildc; Dole, Anita; Lindeberg, Staffan (2005). "Agrarian diet and diseases of affluence--do evolutionary novel dietary lectins cause leptin resistance?". BMC Endocrine Disorders. 5: 10. doi:10.1186/1472-6823-5-10. PMC 1326203 . PMID 16336696. ↑ Arasu, Abirami; Kumaresan, Venkatesh; Sathyamoorthi, Akila; Palanisamy, Rajesh; Prabha, Nagaram; Bhatt, Prasanth; Roy, Arpita; Thirumalai, Muthukumaresan Kuppusamy; Gnanam, Annie J.; Pasupuleti, Mukesh; Marimuthu, Kasi; Arockiaraj, Jesu (2013). "Fish lily type lectin-1 contains β-prism architecture: Immunological characterization". 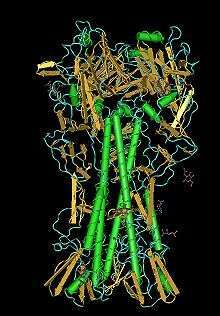 Molecular Immunology. 56 (4): 497–506. doi:10.1016/j.molimm.2013.06.020. PMID 23911406. Halina Lis; Sharon, Nathan (2007). Lectins (Second ed.). Berlin: Springer. ISBN 1-4020-6605-8. Ni Y, Tizard I (1996). "Lectin-carbohydrate interaction in the immune system". Vet Immunol Immunopathol. 55 (1–3): 205–23. doi:10.1016/S0165-2427(96)05718-2. PMID 9014318.